Libra, the Balance, is the sign of the autumn equinox, when day and night are equal. It is associated with relationships, marriage, and has been called ‘the sign of cosmic reciprocity’. Its ruler is Venus, the goddess of love. 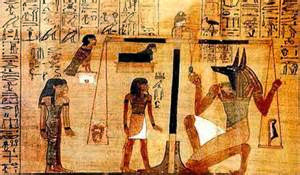 The Greeks called it Zugos,’ the Yoke’, and in Egypt it was represented by the goddess Ma’at, who judged the dead, weighing their souls in the balance: those who passed her test were said to be ‘light hearted’; those who failed were ‘heavy hearted’. Its decans are the Cross, the Victim, and the Crown. Jesus then left that place and went into the region of Judea and across the Jordan. Again crowds of people came to him and, as was his custom, he taught them. 'What did Moses command you?' he replied. Dates refer to 2007 when this sermon was written. On the 23rd September this year the sun entered the zodiacal sign of Libra. You can always tell when the sun is approaching this point on its journey through the heavens, because people start to say (when they can think of nothing else to say), ‘The nights are drawing in now, aren’t they?’ And indeed they are. The long days of summer are over. Now it’s dark at 7.30 pm, and most of us are getting out of bed before dawn. Now day and night are of equal duration – twelve hours or so of each – with the point of exactitude occurring on 23rd September, the day of the autumnal equinox. Six months ago we had the spring equinox, and day and night were equal then, too, but there is a difference between these two points: after the spring equinox, the light begins to dominate; after the autumn equinox, the darkness begins to prevail. Soon, it will be dark when you arrive at work, and dark before you set off home. The contrast between light and darkness, which is almost lost on us because of our electric lights and round the clock lifestyle, would have had a marked impact upon people in times gone by, who would have been compelled to organise their lives around the natural rhythms of night and day. Daylight was for activity and work; darkness for rest and sleep; in the daylight they could be reasonably secure from predators and so could act alone; in the night they were vulnerable and needed each other for safety and for comfort. We still say, ‘Things will look different in the daylight,’ meaning that the light will put a temporary end to those nameless fears which seem to beset us in the darkness. Brendan Behan once described himself as ‘a daylight atheist’, a theological position with which many of us will be familiar: when the sun is shining and we’ve plenty to do, those nagging questions about existence which will often assail us in the darkness seem to evaporate. 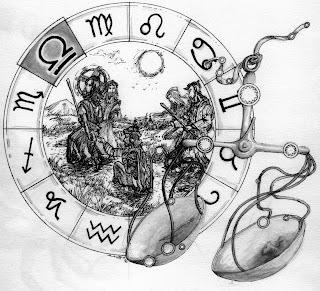 The zodiac, which, as I’ve constantly stressed, is simply the path of the sun in the sky, derives its imagery, in part, from this interplay of light and dark. In the spring, when the light begins to dominate, we have the sign Aries, which symbolises the growing light of individual consciousness struggling against the forces of collective darkness, and so Aries comes to represent the loner, the pioneer, the trailblazer, who heads off almost recklessly to chart new paths for the rest of us to follow. In the autumn, when the darkness begins to prevail, we have Aries’ complementary sign Libra, which symbolises intimacy, relationships, marriage – social and communal activities, as opposed to individualistic ones. Jeff Mayo, who taught me the language of astrology 40 years ago, and whose book Teach Yourself Astrology is still one of the best introductions to the subject, says that Libra symbolises ‘the primitive urge for unity and relatedness with others.... and the need to conform to an ideal pattern of community life’. People who are strongly Libran are said to be cooperative, socially aware, with a strong sense of justice and fair play. Their ‘ruling planet’ is Venus, the planet of love and beauty, which tends to render them amorous, stylish, artistic, refined, but with an unfortunate tendency (they say) to laziness and self-indulgence. The symbol of Libra is the balance, reflecting the equinoctial balance between night and day, but also symbolising the balance between all pairs of opposites: the individual and the community, male and female, work and rest, outgoing and indrawing, initiative and caution. The Libran scales are used as symbols of justice – paying what one owes to the community. On the Old Bailey courts in London, there is a statue of the goddess of Justice with scales in her hands, and in ancient Egypt, Libra was the goddess Ma’at, who was said to weigh the souls of the dead against a feather; those who passed her test were ‘light hearted’, those who failed it ‘heavy hearted’. The word ‘Libra’ is the Latin word for a pound weight, and in the pre-decimal system of weights and measures the pound was abbreviated to ‘lb’, a contraction of Libra. 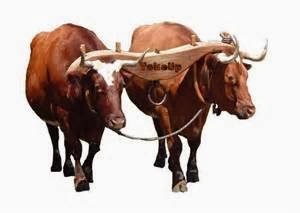 The Greeks called Libra Zugos, the Yoke, which refers to the wooden device fixed across the necks of oxen to keep them together as they were pulling the plough, reflecting once again the notion of harmony, balance, and working together, which are central to the symbolism of Libra. In the Gospel of Mark, the Libran section begins, appropriately, with an argument over marriage. In an attempt to trap Jesus into making an injudicious reply, some Pharisees ask Jesus about the legality of divorcing one's wife. Jesus, quoting from the Book of Genesis, tells them that male and female become ‘one flesh’ in marriage, and that men shouldn’t separate what God has joined together. ‘Joined together’ is a translation of the Greek word ‘sunezeuxen’ which literally means ‘yoked together’, from the very same root as ‘zugos’ the Greek word for the sign Libra. This is added confirmation that Mark is following the sequence of the zodiacal signs in his narrative. she spoiled his dinner by putting too much salt in his food, if she went in public with her head uncovered, if she talked with men in the streets, if she was a brawling woman, if she spoke disrespectfully of her husband's parents in his presence, if she was troublesome or quarrelsome. Divorce, it seems, was possible on the flimsiest of pretexts. This teaching on the sanctity of marriage is an obvious improvement on what preceded it, but the total ban on divorce, which Jesus’ teaching has been used to justify, has left its own legacy of misery and injustice, and I don’t think the text is really advocating this. We undoubtedly need to extend the principles of justice, fairness, and balance into our intimate lives, but there is a deeper meaning to the text which has been missed in all the legalistic moralising which a purely surface reading has occasioned. The mystical traditions preserve another dimension to marriage which transcends its function as a social institution. The union of male and female does not just refer to the coupling we call matrimony. The ‘sacred marriage’ is something that occurs within the individual. ‘In the beginning,’ it says in the Book of Genesis, ‘God created them male and female’. The original, perfect state of the human being is one of balance between spirit (male) and matter (female) were joined in harmonious unity and balance – the image of God -, before being sundered by the Fall. 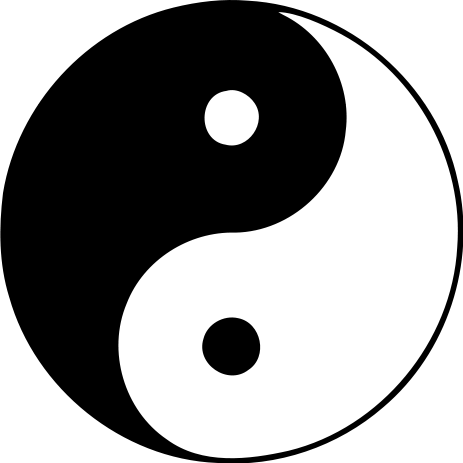 In the Tao Te Ching, which precedes the Christian scriptures by at least five hundred years, we read about the eternal interplay between the opposites, yin and yang. Yin refers to the characteristics of softness, passivity, femininity, darkness, the valley, the moon, the negative polarity; yang refers to characteristics such as hardness, masculinity, brightness, the mountain, the sun, the positive polarity. All reality is based upon these two opposing forces, say the Taoists. Neither is superior; both are necessary, and each contains the seed of the other. The Taoist attempts to see these forces at work in the world and in himself, and to act in harmony with them, uniting the opposite forces within himself. ‘Tao’ means ‘The Way’, and it is significant that Christianity was originally called ‘The Way’. At about the same time that Lao Tzu was compiling the Tao Te Ching in China, Plato was writing Symposium in Greece. 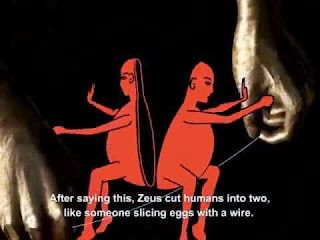 In this dialogue, Plato makes reference to a myth that was probably very ancient even then, that at one time male and female were joined together, and the human being had four legs not two, but because in that state they were considered to present a threat to the gods, Zeus cut them in two, and now the separated halves are doomed to spend their time seeking each other. There was also a warning that, if the two legged creatures misbehave, Zeus would cut them again! At the heart of this myth lies the notion that male and female constitute a unity, a unity that has been lost, but which can and must be re-established within the individual. When you make the two one, and when you make the outside like the inside, and the above like the below, and when you make the male and the female one and the same so that the male be not male nor the female female, then you will enter the kingdom. The ‘sacred marriage’ is not the public jamboree, complete with white dress, bridesmaids, posh food and an exotic honeymoon. The sacred marriage occurs when the spiritually mature individual is able to balance male and female, yang and yin, activity and passivity, spirit and matter, science and mystery, striving and yielding, adventure and repose, and a whole host of other complementary forces, within him or her self. Balancing the polarities within the self may take some doing but it doesn’t require us to learn anything new or to embark upon years of spiritual training. In fact, Robert Fulghum, in his celebrated essay All I Really Need to Know I Learned in Kindergarten says that we were well acquainted with this principle before we started big school. What did we learn by the sand pit in the nursery? It’s as simple as that! And yet how difficult is it in our 24/7, work-hard play-hard, striving, competitive, comparative, acquisitive world is it to put these things into practice! But the great spiritual message of Libra, is that just as day and night come naturally into equilibrium, so must we strive to bring that sense of balance into our own lives. The reward – personally and socially – for finding the balance is immense. As Plato’s myth intimates, when the male and female principles are joined in harmony within an individual, she attains a state in which she could almost challenge the gods.